There now is an English Demo! Please try it out if you think this could be your cup of tea! If you have any feedback you can contact either Playism or Novectacle. Even though they're a Japanese doujin circle, they've always been happy to answer my questions in English - they're very friendly and great people to talk to, so please don't be afraid to let them know what you think of their game! 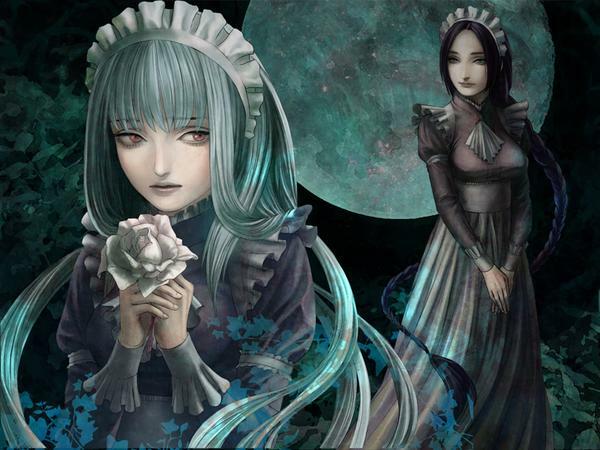 Should we localize The House in Fata Morgana? As you can see, Novectacle started moving to try and have their game localised; I've tried their demo with the help of a translation tool and I really want to be able to enjoy it in a language I can understand. As you can see in the links above, the art is stunning, and from what I could experience, the atmosphere is very interesting and quite different from what most VNs offer. Eerie, gothic, probably a bit horror going on with the story. Before you go and try the demo I'll tell you there is violence and gore, so if it's not your cup of tea or you're not allowed to see that kind of stuff due to your age, you should hold off from downloading it. If you're interested in this and you think you'd like to buy it if it were translated to English, please comment on Playism's post or send them a mail letting them know you're interested! Post on Facebook! Post on deviantArt! Post on Twitter! Post everywhere you can think of so we can get lots of people interested and we can enjoy this in English! There's a video as well, but please be aware there are a couple of scenes with blood in them. Again, if that's absolutely not your cup of tea, I'd advise to steer clear of it, though they're not incredibly gory. Last edited by Ren on Sun Mar 16, 2014 10:33 am, edited 2 times in total. There will be a GxB romances in this game? Not sure, I will try and ask the developer. In the demo there was some angst about The girl with white hair attracting the attention of Nellie's brother, but it's not clear to me whether there will be any focus at all on romance... I'd say this is primarily a horror story. The another question whether we have romances.... yes, we have. Of course we have many essences of horror, but we concentrated more on portraying humans on this game. If you have any other questions, ask us freely. Romance is also an important element. What kind of romances do you have? Maybe they're only GxG ... (sorry, but not my cup of tea)? we have very few scenes of it. The romances in "The House in FataMorgana" is basically the love between men and women. Maybe our image on the package misinform like that. Ren, I'd definitely buy this game if it came out with english text. Updated first post with link to the English Demo. Old topic, but I've been playing through this recently, and it's a great game that needs more attention than it's currently getting. It's pure VN, so there's not many choices happening, though there are a few different endings. It's also dark, tragic and has mature themes, but at a core it is a love story, and a story about the complexity, wonder and pain of human relationships, and it's very, very well-written, gorgeous to look at and has a large number of original music written especially for the game. It's definitely the best-written VN I've ever read, so if you're not averse to dark themes and tragic stories, it's well worth having a look. Very interesting plot with lots of twists and turns, lots of emotion, and complex, psychologically realistic characters. It's available on Steam now and it's somewhat pricey, but fairly long. Try the free demo if you can, and know that it's only about one/fifth of the game, perhaps even less than that.